The Pacsafe RFIDsafe W250 is a RFID blocking travel organiser. There is plenty of room in this travel organiser for 12 cards, a boarding pass, passport, itinerary and more, and the book style zippered opening means you'll be able to whip out what you need, when required. RFIDsafe technology blocks identity scanners from retrieving personal information found in RFID chips in ID and credit cards. 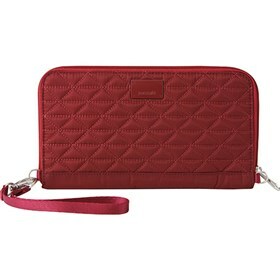 Pacsafe's RFIDsafe W250 organiser has detachable strap that can be secured around the wrist or attached inside the bag. It has13 card slots including zippered mesh slot, zippered note slot, boarding pass slip pocket, open slip pocket and mesh passport holder that fits Euro passport. 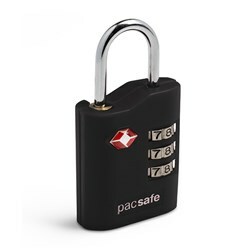 The Pacsafe RFIDsafe W250 has many exciting features for users of all types. It's one of FactoryOutletStore's best selling . You can extend the lifetime of your Pacsafe RFIDsafe W250 with the purchase of a FactoryOutletStore Factory Protection Plan. See the Pacsafe RFIDsafe W250 gallery images above for more product views. FactoryOutletStore stocks a full line of accessories like 4 Dial Retractable Cable Lock and Combination Lock for the Pacsafe RFIDsafe W250. 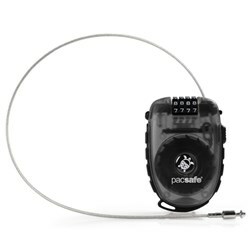 The Pacsafe RFIDsafe W250 is sold as a Brand New Unopened Item.